Artiste de renommée internationale, El Anatsui s’est vu attribuer le Lion d’Or à la Biennale de Venise en 2015 ; récompense suprême pour ce digne représentant du continent africain qui y fut, à ce titre, présenté pour la première fois en 1990. Fidèles à ses racines, il parcourt le monde et attire l’attention internationale avec son travail sur les matériaux recyclés. Ses grandes tentures emblématiques aux reflets mordorés sont réalisées à partir de capsules de bouteilles aplaties reliées par des fils de cuivre dans un assemblage complexe et minutieux mêlant tissu, peinture et sculpture. Souvent monumentales (jusqu’à seize mètres de haut et cinquante mètres de large pour la façade de la Royal Academy à Londres en 2013), ses sculptures métalliques complexes et chatoyantes subliment des matériaux au rebut mais néanmoins empreints d’une charge métaphorique et dont l’usage atteste d’une préoccupation à la fois culturelle et environnementale. Né en 1944 à Anyako, Ghana ; Vit et travaille à Nsukka, Nigeria. - El Anatsui: Triumphant Scale, Haus Der Kunst Munich, Munich, Allemagne. - El Anatsui: Meyina, Iziko South African National Gallery, Le Cap, Afrique du Sud. - Proximately, Axel Vervoordt gallery, Anvers, Belgique. - Benchmarks: New Prints by El Anatsui, October Gallery, Londres, Royaume-Uni. - Prints, Royal Academy, Londres, Royaume-Uni. - El Anatsui, Barakat Gallery, Séoul, Corée du Sud. - El Anatsui, Prince Claus Fund Gallery, Amsterdam, Pays-Bas. - El Anatsui: New Works, October Gallery, Londres, Royaume-Uni. - Afrikas stjerne - Monumentale værker af El Anatsui, Trapholt Museum for Moderne Kunst, South Jutland, Danemark. - El Anatsui: Five Decades, Carriageworks, Sydney, Australie. - El Anatsui, Domaine de Chaumont-sur-Loire, Chaumont-sur-Loire, France. - El Anatsui: Five Decades, The School, Kinderhook, New York, Etats-Unis. - El Anatsui, Kunstbanken Hedmark Kunstsenter, Hamar, Norvège. - El Anatsui, Galerie Mnuchin, New York, Etats-Unis. - El Anatsui: Playing with Chance, Centre for Contemporary Art, Lagos, Nigeria. - El Anatsui: New Worlds, Mount Holyoke College, South Hadley, Etats-Unis. - El Anatsui: Trains of Thoughts, Jack Shainman Gallery, New York, Etats-Unis. - TSIATSIA – Searching for Connection, Royal Academy of Arts, Londres, Royaume-Uni. - El Anatsui: Pot of Wisdom, Jack Shainman Gallery, New York, Etats-Unis. 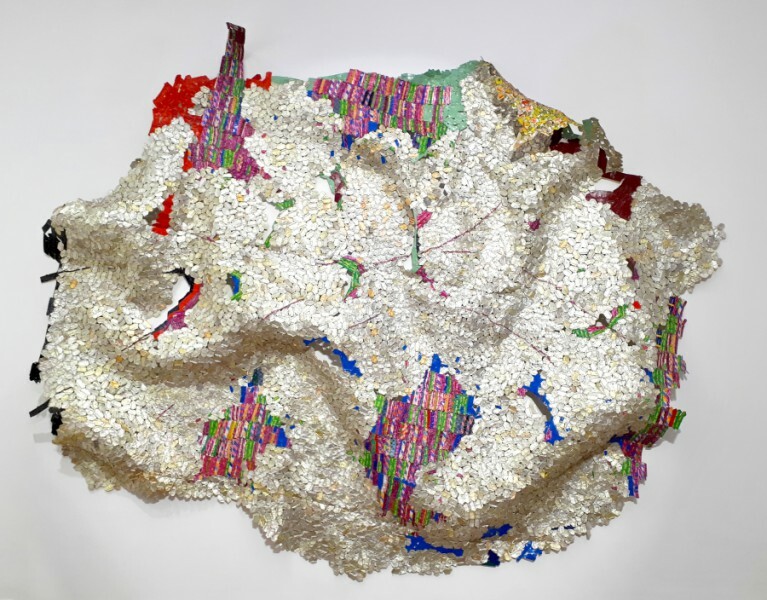 - Gravity and Grace: Monumental Works by El Anatsui, Akron Art Museum, Etats-Unis (puis au Brooklyn Museum, New York, Etats-Unis; au Des Moines Art Center, Etats-Unis; au Bass Museum of Art, Miami, Etats-Unis; et au Museum of Contemporary Art, San Diego, Etats-Unis). - Broken Bridge II, High Line, New York, Etats-Unis. - El Anatsui: Post of Wisdom, Jack Shainman Gallery, New York, Etats-Unis. - Stitch in Time, Axel Vervoordt Gallery, Anvers, Belgique. - Chance Encounters: Seven Contemporary Artists from Africa, Sakshi Gallery, Mumbai, Inde. - El Anatsui, Clark Art Institute, Williamstown, Etats-Unis. - El Anatsui, Jack Shainman Gallery, New York, Etats-Unis. - El Anatsui: Gli, Rice University Art Gallery, Houston, Etats-Unis. - When I Last Wrote To You About Africa, exposition itinérante jusqu’en 2012 (Royal Ontario Museum, Toronto, Canada; Davis Museum, Wellesley College, Wellesley, Etats-Unis; Blanton Museum of Art, University of Texas, Austin, Etats-Unis; North Carolina Museum of Art, Raleigh, Etats-Unis; Denver Art Museum, Etats-Unis; University of Michigan Museum of Art, Ann Arbor, Etats-Unis; Museum for African Art, New York, Etats-Unis). - A Fateful Journey: Africa in the Works of El Anatsui, exposition itinérante jusqu’en 2011 (National Museum of Ethnology, Osaka, Japon; The Museum of Modern Art, Hayama, Japon; Tsuruoka Art Forum, Japon; The Museum of Modern Art, Saitama, Japon). - El Anatsui: Process and Project, BRIC Contemporary Art, New York, Etats-Unis. - El Anatsui, Belger Arts Center, Kansas City, Etats-Unis. - Zebra Crossing, Jack Shainman Gallery, New York, Etats-Unis. - Earth Growing Roots, San Diego State University Art Gallery, San Diego, Etats-Unis. - El Anatsui: Nyekor, Spazio Rossana Orlandi, Milan, Italie. - El Anatsui: Asi, David Krut Projects, New York, Etats-Unis. - Danudo: Recent Sculptures of El Anatsui, Galerie Skoto, New York, Etats-Unis. - El Anatsui: Gawu, exposition itinérante (Oriel Mostyn Gallery, Wales; October Gallery, Londres, Royaume-Uni; Fowler Museum at UCLA, Los Angeles, Etats-Unis; National Museum of African Art, Smithsonian Institution, Washington DC, Etats-Unis). - El Anatsui: Recent Works, October Gallery, Londres, Royaume-Uni. - El Anatsui: As Sculpted History of Africa, October Gallery, Londres, Royaume-Uni. - Hakpa, Centre Culturel français, Lagos, Nigeria. - El Anatsui, October Gallery, Londres, Royaume-Uni. - So Far: Drawings, Paintings, Prints 1963-1993, Institut Culturel italien, Lagos, Nigeria. - Old and New: Exhibition of Sculptures in Assorted Wood by El Anatsui, National Museum, Lagos, Nigeria. Pieces of Wood, Auditorium franco-germanique, Lagos, Nigeria. - Sculptures, Photographs, Drawings, Institut Goethe, Lagos, Nigeria. - Wood Carvings, Cummington Community of Arts, Cummington, Etats-Unis. - Broken Pots: Sculpture by El Anatsui, Consulat britannique, Enugu, Nigeria et Institute of African Studies, University of Nigeria, Nsukka, Nigeria. - Wooden Wall Plaques by El Anatsui, Asele Art Gallery, Nsukka, Nigeria. - Saison d’art 2019, Domaine de Chaumont sur Loire, France. - African Metropolis. An Imaginary City. MAXXI National Museum of 21st Century Arts, Rome, Italie. - Ceremonial Exhibition: Work by New Members and Recipients of Awards, American Academy of Arts and Letters. New York, Etats-Unis. - Second Life. Museum of African Contemporary Art Al Maaden, Marrakech, Maroc. - Carnegie International, 57th Edition 2018, Carnegie Museum of Art. Pittsburgh, Etats-Unis. - Deviations, Musée Bargoin, Clermont-Ferrand, France. - KIAF 2017, Art Seoul, Galerie RX, Séoul, Corée du Sud. - Afriques Capitales : Cape of Good Hope Here We Come, Lille 3000, Lille, France. - 9ème saison d’art de Chaumont-sur-Loire, France. - Baku: Franz Ackerman, El Anatsui, Michelangelo Pistoletto, Richard Wilson. Gazeli Art House. Londres, Royaume-Uni. - A Journey: El Anatsui, Anish Kapoor, Jannis Kounellis. Kewenig, Berlin, Allemagne. - La Terra Inquieta/The Restless Earth, Fondazione Nicola Trussardi, Milan, Italie. - African Artists as Innovators, Cantor Arts Center, Stanford University, Stanford, Etats-Unis. - Marrakech Biennale 6: Not New Now, Marrakech, Maroc. - Ugwu, Domaine de Chaumont-sur-Loire, Chaumont-sur-Loire, France. - El Anatsui, Hilla and Bernd Becher, Maya Lin: Of A Different Nature, Jack Shainman Gallery, New York, Etats-Unis. - Summer Exhibition 2016, Royal Academy of Arts, Londres, Royaume-Uni. - Us Is Them, The Pizzuti Collection, Columbus, Etats-Unis. - Field, Road, Cloud: Art and Africa, Anna K. Meredith Gallery, Des Moines Art Center, Des Moines, Etats-Unis. - Embracing Space and Color: Art On & Off the Wall, Vero Beach Museum of Art, Etats-Unis. - Meet Me Halfway: Selections from the Anita Reiner Collection, Galerie Cristin Tierney, New York, Etats-Unis. - Piece Work, Yale University School of Art, New Haven, Etats-Unis. - Summer Exhibition 2015, Royal Academy of Arts, Londres, Royaume-Uni. - Atopolis: WIELS @ Mons 2015, Manège de Sury, Mons, Belgique. - Standing and Hanging, Galerie Altman Siegel, San Francisco, Etats-Unis. - Mise En Scène, The School, Kinderhook, New York, USA. - The Art of Our Time: Masterpieces from the Guggenheim Collections, Guggenheim Bilbao, Espagne. - Boca Raton Museum of Art, Etats-Unis. - Chosen, 5 Beekman Street, New York, Etats-Unis. - Earth Matters: Land as Material and Metaphor in the Arts of Africa, National Museum of African Art, Smithsonian Institution, Washington, D.C., Etats-Unis. - Art and Textiles, Kunstmuseum Wolfsburg, Allemagne. - 1st Montevideo Biennial, Montevideo, Uruguay. - Summer Exhibition 2012, Royal Academy of Arts, Londres, Etats-Unis (Façade du Burlington House). - 18ème Biennale de Sydney, Australie. - Paris Triennial 2012, Palais de Tokyo, Paris, France (organisé par Okwui Enwezor, Claire Staebler, Emilie Renard, Melanie Bouteloup et Abdellah Karroum). - African Cosmos: Stellar Art, National Museum of African Art, Smithsonian Institution, Washington D.C., Etats-Unis. - Environment and Object in Recent African Art, Skidmore College Frances Young Tang Teaching Museum and Art Gallery, Saratoga Springs, New York, Etats-Unis (exposition itinérante: Anderson Gallery, Virginia, Commonwealth University, Richmond, Etats-Unis; Middlebury College Museum of Art, Middlebury, Etats-Unis). - Architectural Environments for Tomorrow: New Spatial Practices in Architecture and Art, Museum of Contemporary Art Tokyo, Tokyo University of the Arts, Japon. - The World Belongs to You, Palazzo Grassi, Venice, Italie (organisé par Caroline Bourgeois). - Hunters and Gatherers: The Art of Assemblage, Sotheby’s, New York, Etats-Unis. - ARS 11, Museum of Contemporary Art Kiasma, Helsinki, Finlande. - A Collective Diary, an African Contemporary Journey, Herzliya Museum of Contemporary Art, Israël. - Who Knows Tomorrow, Nationalgalerie, Berlin, Allemagne. - Human Rites, Bass Museum of Art, Miami Beach, Etats-Unis. - Extreme Frontiers, Urban Frontiers, Institut Valencia d'Art Modern, Valence, Espagne. - Against Exclusion, 3ème Biennale d’Art Contemporain, Moscou, Russie. - Transavangarde, October Gallery, Londres, Royaume-Uni. - Angaza Afrika, October Gallery, Londres, Royaume-Uni. - World Histories, Des Moines Art Center, Etats-Unis. - Art Basel 39, Basel, Suisse. - Recycling: The Whole House, Kunstbanken Hedmark Kunstenter, Hadmar, Norvège. - Grandeur, 10th Sonsbeek International Sculpture Exhibition, Sonsbeek, Pays-Bas. - Second Lives: Remixing the Ordinary, Museum of Arts and Design, New York, Etats-Unis. - The Poetics of Cloth: African Textiles/Recent Art, Grey Art Gallery, New York University, New York, Etats-Unis. - The Essential Art of African Textiles: Design without End, Metropolitan Museum of Art, New York, Etats-Unis. - Prospect.1, New Orleans, Etats-Unis. - Uncomfortable Truths: The Shadow of Slave Trading on Contemporary Art and Design, Victoria and Albert Museum, Londres, Royaume-Uni. - From Courage to Freedom: El Anatsui/Hazoumé/Owusu-Ankoma, October Gallery, Londres, Royaume-Uni. - Contemporary African Art from the Collection of William Jones, Aljira: A Center for Contemporary Living Masters, Guaranty Trust Bank, Lagos, Nigeria. - Trans Cape: Contemporary African Art on the Move, Le Cap, Afrique du Sud. - Still Life: Art Ecology & Politics of Change, Sharjah Biennial 8, Emirats Arabes Unis. - Artempo: Where Time Becomes Art, Palazzo Fortuny, Venise, Italie. - Think with the Senses, Feel with the Mind: Art in the Present Tense, 52ème Biennale de Venise, Italie. - Un/Fair Trade: The Art of Injustice, Neue Galerie, Graz, Autriche. - Tapping Currents: Contemporary African Art and the Diaspora, Nelson-Atkins Museum of Art, Kansas City, Etats-Unis. - BoysCraft, Haifa Museum of Art, Israël. - The Black Panther Rank and File, Yerba Buena Center of Arts, San Francisco, Etats-Unis. - Dak'Art 2006, 7ème Biennale de l'Art Africain Contemporain, Dakar, Sénégal. - The Missing Peace: Artists Consider the Dalai Lama, exposition itinérante aux Etats-Unis et au Japon. - Body of Evidence, National Museum of African Art, Washington DC, Etats-Unis. - Altered, Stitched and Gathered, P.S. 1 Contemporary Art Center, Long Island City, New York, Etats-Unis. - Poiesis, Jack Shainman Gallery, New York, Etats-Unis. - Expanding Africa: New Art, New Directions, Newark Museum, Newark, USA. - Afrique-Europe: Rêves Croisés, Ateliers des Tanneurs, Bruxelles, Belgique. - Triennal de Luanda, Angola. - Primitivism Revisited: After the End of an Idea, Sean Kelly Gallery, New York, Etats-Unis. - Out There, Sainsbury Centre for the Visual Arts, Norwich, Royaume-Uni. - In the Making: Materials and Process, Michael Stevenson Gallery, Le Cap, Afrique du Sud. - AKA... of Age 2005, Maison de France, Lagos, Nigeria. - Africa Remix: Contemporary Art of a Continent, exposition itinérante (Museum Kunstpalast, Centre Pompidou, Moderna Museet...). - A Grain of Dust, A Drop of Water, 5th Biennale de Gwangju, Corée du Sud. - Intelligence Now! , October Gallery, Londres, Royaume-Uni. - Selected Works, Skoto Gallery, New York, Etats-Unis. - Hommage to Asele, National Museum, Lagos, Nigeria. - Biennale of Ceramics in Contemporary Art, Villa Groppallo, Vado Liguire, Italie. - Africa Informs, October Gallery, Londres, Royaume-Uni. - Transfers, Palais des Beaux-Arts, Bruxelles, Belgique. - International 2002, Liverpool Biennial, Liverpool, Royaume-Uni. - Jazz and Visual Improvisations, Katonah Museum of Art, Katonah, New York, Etats-Unis. - News from the Front, October Gallery, Londres, Royaume-Uni. - Africas: The Artist and the City, Centre de Cultura Contemporania de Barcelona, Barcelone, Espagne. - The Happy Face of Globalization, 1st Albissola Ceramics Biennale, Museo Civico d’Arte Contemporanea and Mueo della Ceramica Manlio Trucco, Albissola, Italie. - Ebony Soliloquy: A Five Year Retrospective, Stella Jones Gallery, New Orleans, Etats-Unis. - Elf Village, Port Harcourt, Nigeria. - Encounters with the Contemporary, National Museum of African Art, Smithsonian Institution, Washington DC, Etats-Unis. - El Tiempo de Africa, Centro Atlantico Arte Moderno, Las Palmas, Canary Islands and Consejeria de Cultura de Comunidad, Madrid, Espagne. - Messagers de la Terre, Rur’Art-Espace d’Art Contemporain de Lycée Agricole Xavier Bernard, Rouillé, France. - New Colours from Old Worlds : Contemporary Art from West Africa, October Gallery, Londres, Royaume-Uni. - Les Champs de la Sculpture, Champs Elysées, Paris, France. - The Independent, 1st Liverpool Biennial of Contemporary Art, Liverpool, Royaume-Uni. - Transvangarde, October Gallery, Londres, Royaume-Uni. - Riddle of the Spirits – Twelve African Artists, Skoto Gallery, New York, Etats-Unis. - By Hand and By Computer, Contemporary African Art Gallery, New York, Etats-Unis. - Osaka Triennale: Sculpture, Osaka, Japon. - Triennale der Kleinplastik, Stuttgart, Allemagne. - The Poetics of Line: Seven Artists of the Nsukka Group, National Museum of African Art, Smithsonian Institution, Washington DC, Etats-Unis. - Free Form and Precision, Contemporary African Art Gallery, New York, Etats-Unis. - Africana, Sala 1, Rome, Italie. - AKA ’96, Bona Gallery, Enugu, Nigeria. - El Anatsui & Sol LeWitt, Skoto Gallery, New York, Etats-Unis. - Transforms, October Gallery, Londres, Royaume-Uni. - West African Sculpture-East African Painting, Contemporary African Art Gallery, New York, Etats-Unis. - Tranvangarde: Cutting-edge Work from Africa, Asia, the Americas and Europe, October Gallery, New York, Etats-Unis. - Container ’96-Art across Oceans, Langelinie, Copenhague, Danemark. - Images of Africa, Torpedohallen, Copenhague, Danemark. - Group Exhibition, Avant-Garde Gallery, Kaduna, Nigeria. - Art in the Shadow, Nigerian Pavilion, Africus: 1st Johannesburg Biennale, Johannesburg, Afrique du Sud. - Uli Art-Master Works, Skoto Gallery, New York, Etats-Unis. - Seven Stories about Modern Art in Africa, Whitechapel Art Gallery, London, UK; Malmö Konsthall, Malmö, Suède. - An Inside Story: African Art of Our Time, exposition itinérante au Japon. - Contemporary African Art, World Intellectual Property Organization Headquarters, Genève, Suisse. - The Right to Hope, Johannesburg Art Gallery, puis exposé au Caire, à Amman, à Gaza, à Jérusalem et à Tel-Aviv. - Configura 2, Erfurt, Allemagne. - AKA ’94, Bona Gallery, Enugu; Didi Museum, Lagos, Nigeria. - Arte/Sociedad/Reflexions, 5ème Biennale de La Havane, Cuba. - AKA ’93, Bona Gallery, Enugu; Didi Museum, Lagos, Nigeria. - New Currents ’93: Avant-Garde Nigerian Art, Didi Museum, Lagos, Nigeria. - Six African Artists, October Gallery, Londres, Royaume-Uni. - AKA ’92, Bona Gallery, Enugu; Didi Museum, Lagos, Nigeria. - Arte Amazonas, Modern Art Museum, Rio de Janeiro, Brésil. - Klima Global, Staatliche Kunsthalle, Berlin; Ludwig Forum, Aix-la-Chapelle, Allemagne. - Works by a Group of African Artists, The World Bank Art Society, Washington DC, Etats-Unis. - AKA ’91, Bona Gallery, Enugu; National Museum, Lagos, Nigeria. - Sculptors Guild of Nigeria: Inaugural Exhibition, Murtala Mohammed Park, Enugu, Nigeria. - El Desafio de Colonization, 4ème Biennale de La Havane, Cuba. - Il Sud del Mondo: L’altra arte contemporanea, Galleria Civica d’Arte Contemporaneo, Marsala, Italie. - Contemporary African Artists: Changing Tradition, Studio Museum in Harlem, NY; Afro-American Historical and Cultural Museum, Philadelphie; Chicago Public Library Center, Chicago, Etats-Unis. - AKA ’90, Hotel Presidential, Enugu; Goethe-Institute, Lagos, Nigeria. - Dimensione Futuro: l’Artista e lo Spazio, 44ème Biennale de Venise, Italie. - The Calabash 1st Art Exhibition, The Calabash, Lagos, Nigeria. - AKA ’89, Hotel Presidential, Enugu; National Gallery of Art, Lagos, Nigeria. - Zeitgenössische Nigerianische Kunst, Bonn, Bocholt et Mönchengladbach, Allemagne. - AKA ’88, a.o. National Gallery of Art, Lagos, Nigeria. - SSART Exhibition, ANA Gallery, University of Nigeria, Nsukka, Nigeria. - An Exhibition of Sculptures in Wood: Thoughts and Process, Italian Cultural Institute, Lagos, Nigeria. - Walls and Gates, Avant Garde Gallery, Kaduna, Nigeria. - AKA ’87, Hotel Presidential, Enugu; National Gallery of Crafts and Design, Lagos, Nigeria. - Nigerian-German Prints, University of Nigeria, Nsukka; Franco-German Auditorium, Lagos, Nigeria. - AKA ’86, Inaugural exhibition of the AKA Circle of Exhibiting Artists, French Centre/Ministry of Education, Enugu; Goethe-Institute, Lagos, Nigeria. - Four Contemporary Artists, Mintec Galleries, Port Harcourt, Nigeria. - Okiki 10th Anniversary Exhibition, University of Nigeria, Nsukka, Nigeria. - Drawing on the World, Bilingham Art Gallery, Billingham; Middlesborough Art Gallery, Middlesborough; House of Commons Gallery, Westminster, Londres, Royaume-Uni. - The Nsukka School, Art Gallery of the Rivers State Council for Arts and Culture, Port Harcourt, Nigeria. - Christian Arts in Nigeria, Holy Trinity Cathedral Hall, Onitsha, Nigeria. - Dyed Fabric Wallhangings, Burnt-Scorched Wooden Wall Plaques, Institute of African Studies Gallery, University of Nigeria, Nsukka, Nigeria. - Tekarts Expo 5, Accra Arts Center, Accra, Ghana.